Are you a Ronda Rousey fan? Well, then, there are five reasons you might want to get a game this week. Anyone who purchases a game in December will get a free license for the beta version of Forgotten Trail thrown in as a bonus. Ronda makes a cameo appearance as a character in the game in a video in Level 5. The video is being finished and dropped into the game this week. That’s 2 games for under ten bucks! Ronda is an alpha tester for our game. That is, if we think a level at the “difficult” setting may be impossible to win, we have her play it. If she can win it, it goes in the game. 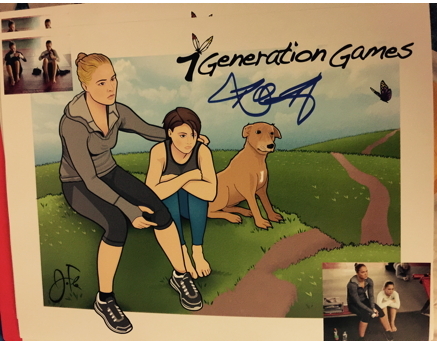 We have 8 autographed photos left from the Kickstarter campaign. We are sending them to the first 8 people who sponsor a classroom license. Do a good deed for the community, get a Forgotten Trail license for yourself and a bit of memorabilia. Even if you think MMA stands for “Museum of Modern Art”, you’ll still like Fish Lake because it teaches fractions. Help keep your brain sharp over the break. Also, it runs on both Mac and Windows computers. For those of you who are mathematical geniuses, you can whip through the math challenges, play a fun game and still learn about Ojibwe culture in the process. Click here to buy, check out Fish Lake (and our earlier game, Spirit Lake, which teaches multiplication, division and a lot about Dakota culture).